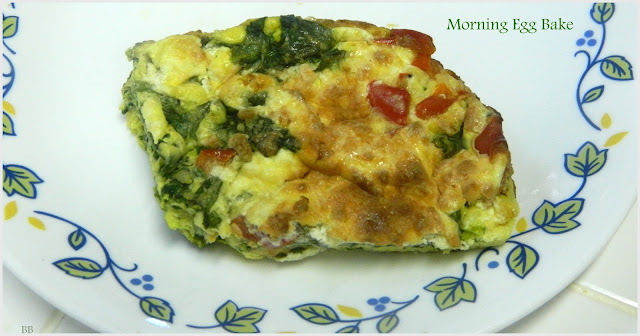 I looked online for a similar recipe by Hazan and I found it here. This makes a larger quantity and does NOT have anchovies. Otherwise with minor exceptions, the recipes are almost the same. Since the ingredients are the same, I decided to make the one from the book without the anchovies. Before I fill you in on this recipe, I must share these were supposed to be mashed. I wasn't in the mood for sweet mashed potatoes and I knew the flavor would be the same, so I left the potatoes in chunks. These mulled cider sweet potatoes were selected by Peggy and they are too easy to make and delicious. I guess the hardest part was peeling the potatoes. Added to the potatoes were butter (it was optional and I opted out.) maple syrup and spices. You can probably imagine the taste. 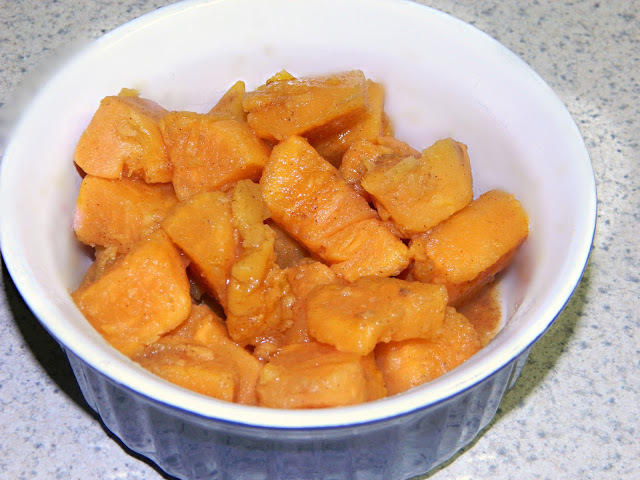 Of course, I think you almost can't go wrong with any sweet potato recipe. Do check out EwE page and see what the other cooks have made. We do not print the recipes from our group and we think that you would like having this book, Weeknight Wonders in your own home. In the Jun/Jul 2015 Donna Hay Magazine on page 32, you will find a recipe for Pumpkin, Caramelized Onion, and Feta Gratin. 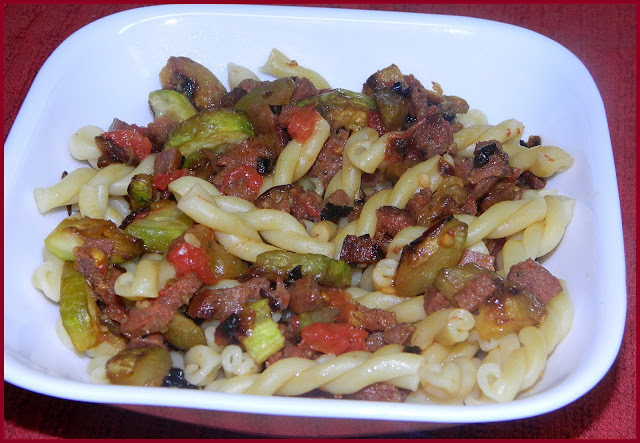 This week, Gaye selected this intriguing recipe for our group, WwDH to make. When I first saw it, I was quite happy about the choice and already knew, I would use butternut squash. My problem was, in this case, I felt I needed a photo and since I did not have the magazine, I only had a copy of the printed word. The recipe called for chopped squash or pumpkin, but I had no idea what the size was. Was it more diced like chop or a bigger one? I guessed and easily lived with the decision. I can't wait to check out everyone else and see how they interpreted this if they also did not have the magazine. Also caramelized onion relish was called for (store bought) and I have never seen that in any of the stores. I simply caramelized the onions and ended up burning some, in the process. 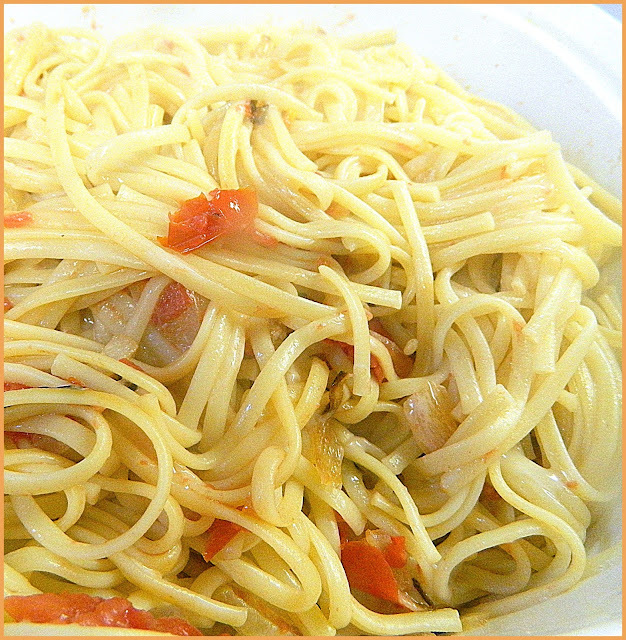 Fill a pot for the pasta with about 4 quarts of water, place over high heat, and bring to a boil. In a skillet, add peas and bell pepper to the olive oil and season generously with salt and pepper. Stir the peas and bell pepper well, then add about 1/2 cup water. 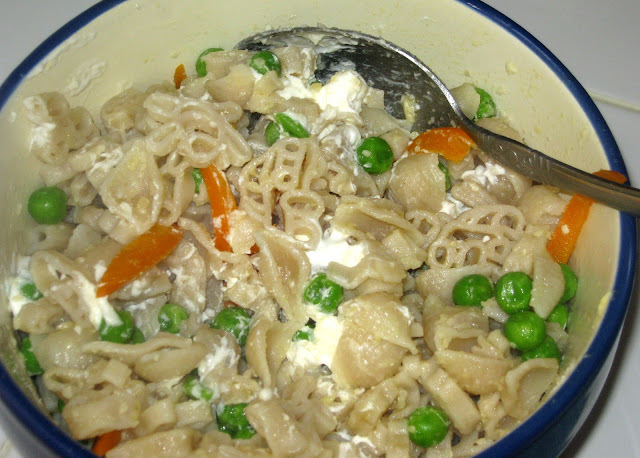 Cook over medium heat until the peas are tender, adding water if it evaporates completely before they are done. It should take 15 to 20 minutes for the peas to become tender. When the peas are tender, remove from the heat, take out about half the peas and puree them. I use my mini food processor. Put the pureed peas back in the pan with the whole peas. I am proud of myself. I selected this week's recipe for Eating with Ellie (EwE). I loved this and it could not be easier. Two minutes is really two minutes. It is called Two-Minute Mango Coconut Sorbet. 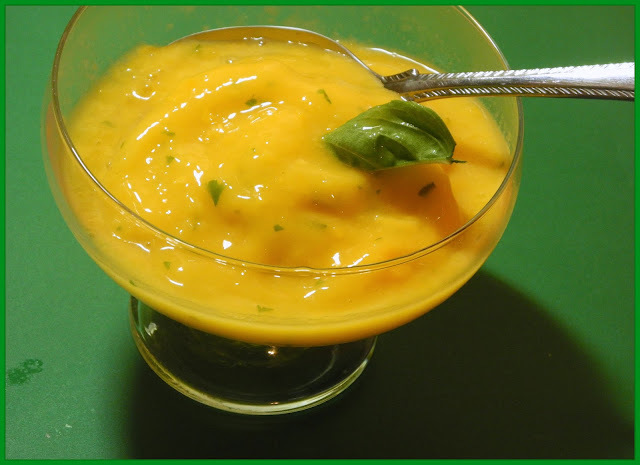 The recipe has four simple ingredients, frozen mango (I am sure fresh mango can be used), honey, basil and coconut milk. Into the blender and zap, you have a frosty refreshing scrumptious dessert, breakfast, snack or whatever you want whenever you want it. I could sit down to these, particularly in the hot weather at any time. I made mine while the mango was still partially frozen so it came out icy cold but it can be frozen or it can be put in the refrigerator. In my opinion, icy is better. I liked this more than I have liked any dessert in a long time and that includes chocolate. I am sure, you could make this with any fruit if you are not a mango fan. Peaches to blueberries should work. The proof that this was a yummy dessert is that it disappeared quickly. Do people like peanut butter as much as chocolate? Peanut butter is an interesting spread. I put some on a cracker for my granddaughter who pushed it away. Then, I gave her a spoonful of peanut butter which she loved and wanted more. I happen to agree with her. There is nothing like a spoonful of peanut butter, rich and creamy and delicious. I grew up on cream cheese and jelly sandwiches but I have a feeling others went the peanut butter and jelly route. Did I miss out? Childhood memories of strange and delicious foods. I used to take a sandwich maker which was a metal mold on the end of a long pole that you put in a sandwich and hold over the fire. I used to put apple sauce between two pieces of white bread and "cook" it and it was out of this world. Who would have thought....? I bought the Kitchn cookbook after being impressed with the site, The Kitchn. I did not get far into the recipe pages when two dishes jumped out at me, Sweet Potato and Caramelized Onion Hash with Baked Eggs and Morning Egg Bake with Turkey, Red Peppers and Spinach. I do not like the name of either recipe - much too long and specific but they did get my attention. I think, in general, cooks have started listing too many ingredients in the titles of recipes, and that includes me. I made the latter without the turkey and had a pretty and tasty dish in front of me. I also cut the recipe way back to accommodate my needs. Spray a 6 inch square pan. In a medium sized bowl, beat eggs and add in milk, salt and black pepper. Mix Parmesan and goat cheese into egg mixture. I found the recipe online so I am posting it this week. This is from Guiliani Hazan't book, Thirty Minute Pasta which a few of us cook from weekly. The more I am using this book, I am finding its strengths and weaknesses. For me, the book is a challenge because so many recipes are not kosher. They either use pork or bacon or ham or there is a milk product and meat in a recipe. When I remove or replace the item, the recipe, in some cases becomes a duplicate of another recipe in the book. In fact, this recipe is made with ricotta, elsewhere in the book. There are still plenty of recipes to make and then, there are those I modify to make the recipe work for us. 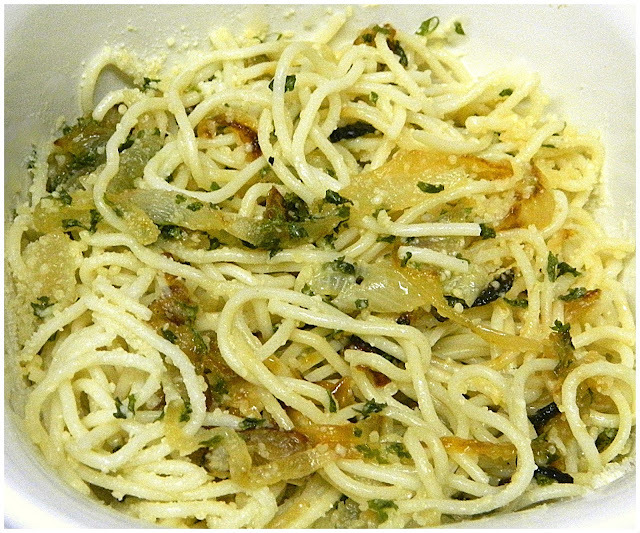 In fact, in this one, I removed Parmesan which I could not use with the sausage in the recipe. I also did not use the pork sausage which was called for. The other ingredients worked so I am paralleling the recipe - "almost." 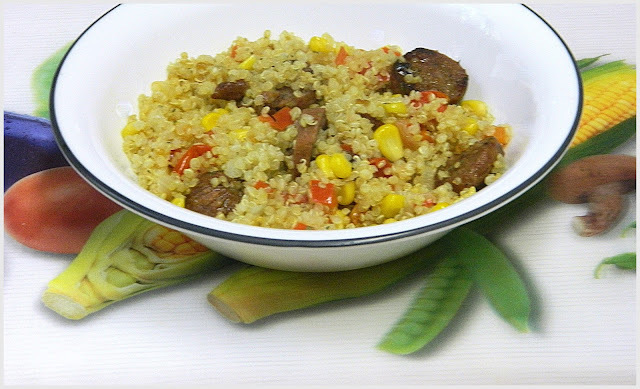 This week, in Eating with Ellie, Margaret selected Corn and Quinoa with Sausage found on page 158 in Weeknight Wonders. I was thrilled when I saw this on our list. Corn and sausage always appeal to me and quinoa is not far behind. All three sounded like a winning recipe and in fact, it was. The procedures went quickly although, you do have to prepare by cooking the quinoa and frying up the sausage and vegetables. I did both at the same time to speed the process and the whole thing, did not take long. Quinoa cooks much more quickly than rice which is why I have been choosing it for recipes above the brown rice, I used to cook, so much of the time. The sausage gives this a great flavor as does the cilantro. I expected this to be a favorite and I was not disappointed. Let's find out what the other ladies did with this recipe at our site. This week for Wednesdays With Donna Hay, Peggy chose Pear and Almond Galettes from the book, Off the Shelf, located on page 160. This is not the season for pears so I used peaches. 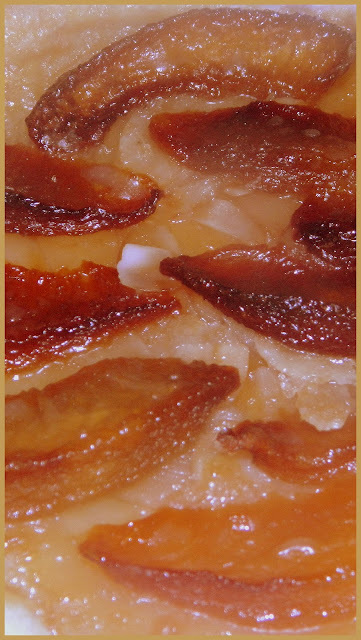 This is an easy recipe, using puff pastry for the galette crust. I have made several Donna Hay recipes, making use of puff pastry and it is a pleasure to get through a recipe quickly and easily. 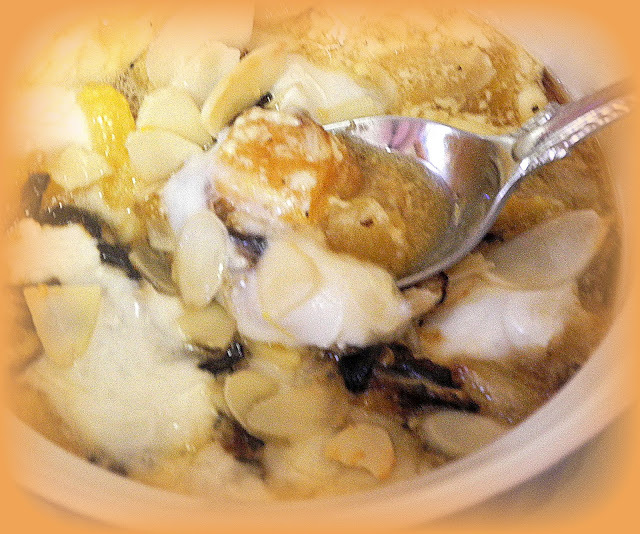 It made a nice dessert with the peachy flavor. I am sure pear would work as well. To find out......... check out our page and see what the other gals have done with this recipe. Taking request for dishes is lots of fun. Sometimes, it results in a brand new dish that I have not experienced and sometimes, it is an old favorite which I have not made in a long time. Either way, I usually turn out enjoying something with new flavors or old flavors remembered. 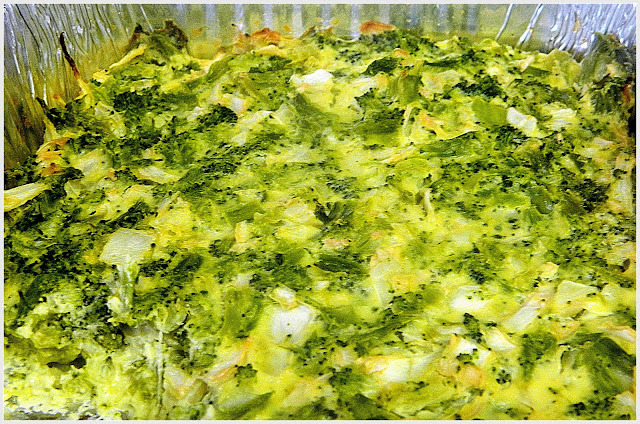 This time is is broccoli kugel, a simple recipe which tastes so much richer than expected. Spray a 9 x 14 pan with cooking oil. Boil water and cook broccoli until soft enough to mash. Using a food processor, mix eggs, mayonnaise, broccoli and onion. Pour into prepared pan and bake for 43 minutes or until knife inserted in center, comes out clean. The clue to success - add pastrami. I have been using pastrami recently, a meat, I rarely use because of the high salt content. I seem to be craving it. I see the word in print and I must make the recipe. I make a dish and see pastrami as an added ingredient that will enrich the original recipe. I am enjoying eating this but frankly, I have to crack down on myself and stop adding it to so many dishes. In the meanwhile, I highly recommend the taste. Add onions and sauté till golden and crispy, about 15 minutes. Remove from skillet and place on paper towels. Add pastrami and garlic to the skillet and sauté 3–5 minutes. 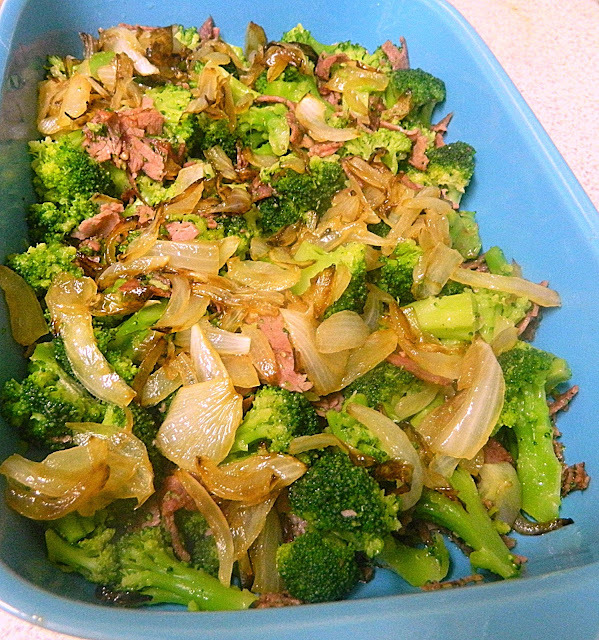 Add broccoli and sauté another 5–7 minutes. Before serving, sprinkle with onions. This is a recipe, I took from my old blog, My Sweet and Savory. 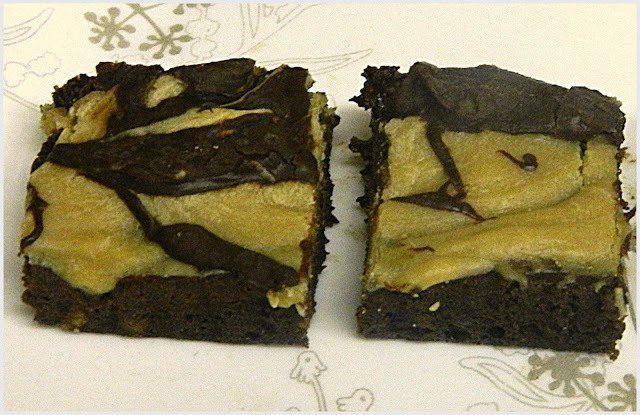 I plan to make these for Shabbos and hope to post a new and better photo of the blondies. 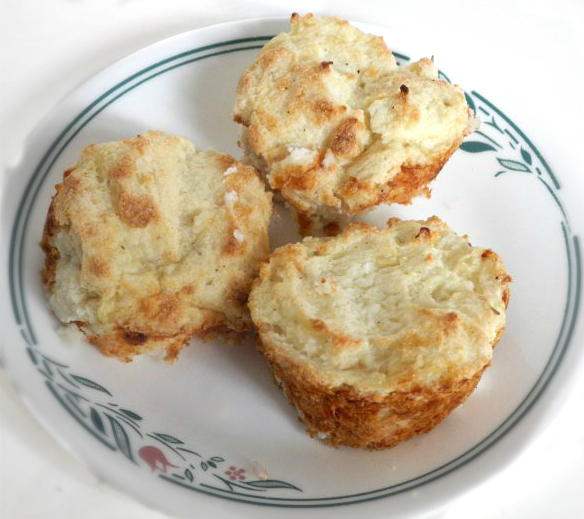 I have not made Dories' baked goods in a while and I love her recipes. When I saw this, I decided that I could not wait any longer to indulge myself so hopefully, in a day or two, these will exist again in our house. They are for my wonderful grandson and his wife who are joining on this Shabbos. Here is a photo of the new blondies. Instead of covering the whole blondie with chocolate. I dropped spatters over it. I have been having fun with puff pastry. It turns out looking presentable and it is delicious. I asked last week's Shabbos guests if their kids wanted chocolate and marshmallow or chocolate and peanut butter. Both were approved so I ended up making both being a good hostess. I could have used peanut butter in the puffs instead of the marshmallow and I am not sure which would have been better. These were good and I could not eat just one. 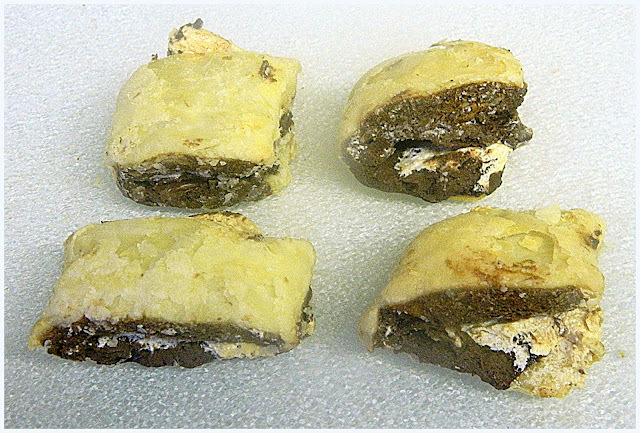 Lightly flour a board or counter top and lightly roll out the thawed pastry dough slightly. Divide according to lines on dough. I used Pepperidge Farm. Brush water on the edges. 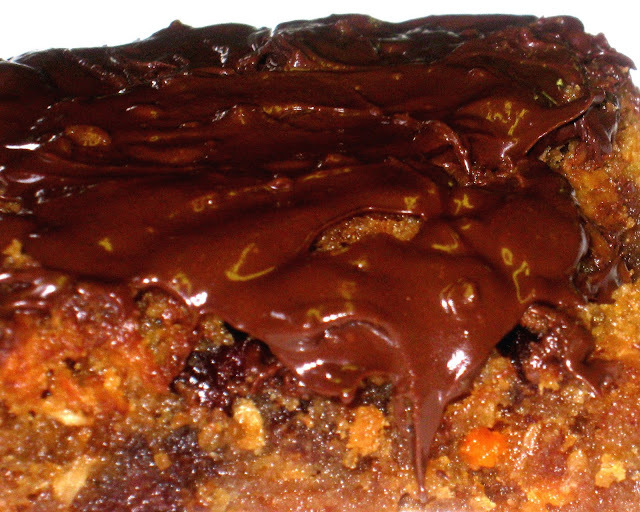 On one half of the piece, spread about 1 tablespoon chocolate spread, leaving a small edge on all sides. Brush the tops with an egg wash and sprinkle granulated sugar on top. I had someone doing some work in my house and decided to treat her to my weekly pasta four Thirty Minute Pasta Group based on the book of the same name by Giuliano Hazan. I hurried to get the book and then searched through the many pages, I had marked. I was thinking zucchini since it is in such abundance, presently. So are tomatoes and when I saw the combination of basil, mozzarella, tomato and pasta, I stayed with that recipe, found on page 93 of the book. I forgot to include the basil and added it after the picture was taken. It makes a difference in the taste of this dish. Both of us ate and enjoyed this combination. To see what the other ladies made check out Kayte, Margaret, Peggy, Glennis. 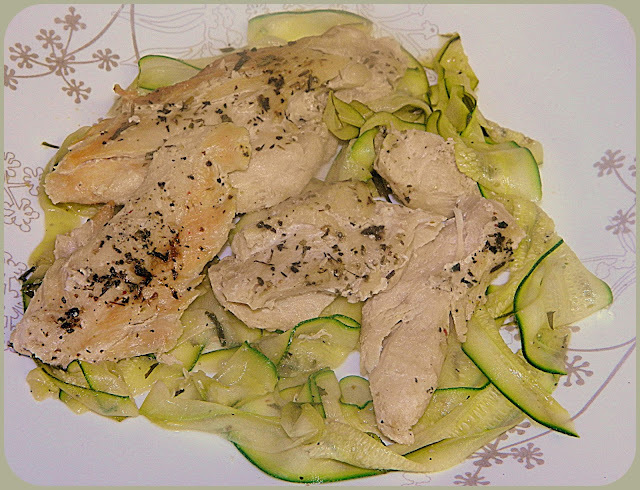 This week's recipe was selected by Kayte and is called Lemon-Tarragon Chicken with Squash Ribbons. I have been wanting to make zucchini ribbons for a while but you know how something can fall under the radar which this did. It is so easy to do, I can't imagine why I waited. I only used zucchini while the recipe called for both green and yellow squash, Cooking for one means (to me) cutting back on some of the ingredients when it looks workable. In this case, all I could see the yellow squash doing was adding color to the recipe which is nice but not a necessity. It was a good dish, a little too lemony for me but easily edible. I would make it again and change the flavor slightly. This may not be a common citrus to use in such a recipe, but I think I would like orange. You can share in everyone's results at our Eating with Ellie page. Please join us.